Gamblogger: Christmas Day Blackjack Boost -- 10% Added to All Wins! Christmas Day Blackjack Boost -- 10% Added to All Wins! Play Blackjack at Intertops Poker or Juicy Stakes on Christmas Day and the casino will automatically add 10% to your winnings! Blackjack winners can get up to $250 extra. All you have to do to get your 10% Christmas Blackjack Boost is play Blackjack on Christmas Day. It will be instantly credited to your bonus balance (15X play-through). 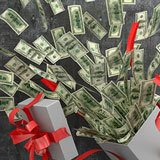 Blackjack players at Intertops Poker and Juicy Stakes will get 10% added to all their wins on Christmas Day. Intertops Poker and Juicy Stakes are known all over the world for their busy poker rooms. They also offer a selection of online slots and table games from Lucktap, Betsoft and Worldmatch.